Players jumped in by the millions to finish the fight in Halo 3, back in 2007. And yet, like many a franchise before it, the one-time trilogy of Halo games finds itself with a new fourth sibling, years later. This year, the old franchise-Halo first launched in 2001-found itself in new hands, no longer developed by Bungie but by 343 Studios. Fans wondered (and worried) if a new developer could keep waving the flag, carrying the torch, and so on. Reviewers now universally agree: indeed they can. 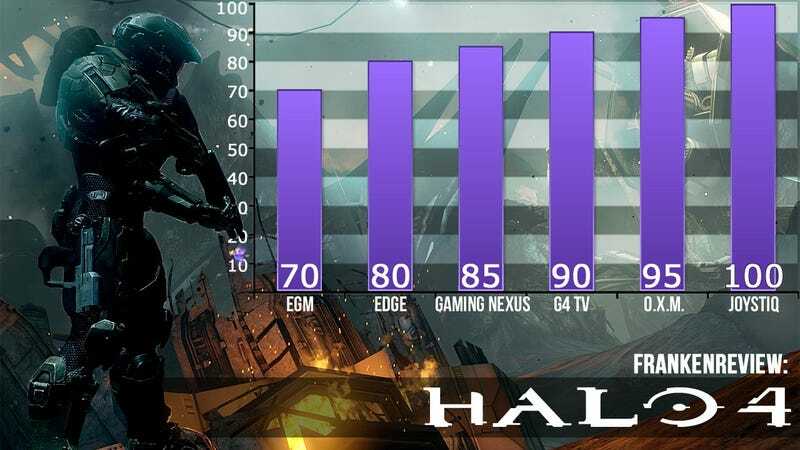 The most negative review of Halo 4 finds it too much like other Halo games, while the most glowing all praise its devotion to characters and a story that fans have spent over a decade learning to love. How do the single-player saga of Master Chief and the multiplayer spectacle of Spartans at war fit together? Read on. The first 15 minutes of Halo 4 almost fooled me. Taking the fondly familiarized formula of a recently awakened Master Chief under siege and standing it on its ear, the opening moments of 343i's first flight in the captain's chair looked a lot like a revolution. Halo 4 comes out flexing like the Hulkster, showing off a drastically improved lighting engine, a pair of perilous interactive sequences, and a white-knuckle grasp of the elements that made the Xbox family's flagship title what it is today. In fact, Halo 4 looked an awful lot like the future of sci-fi shooters. But after the thrill of better visuals wore off and the eager anticipation for more non-shooting thrills went mysteriously unfulfilled, I was left with a frustratingly similar Halo experience that other top-tier shooters have long since blasted into the oblivion of dog-tired gaming conventions. And while many of the Forge faithful will breathe a resounding sigh of relief at the sameness of it all, I can't help but wonder if yet another by-the-book romp was what we needed. The trump card is the same as always: a sense of solidarity in movement and aiming that makes weighty sense of fighting through the bio-enhanced body of a supersoldier. And Halo 4's focus is tightly pulled onto close-quarters encounters, highlighting this kinetic accomplishment. The grand staged battles favoured by the preceding sequels are gone, replaced by tightly mapped fights with small clusters of Prometheans and Covenant; the lessons of Assault On The Control Room have been learnt and are repeatedly put into practice. We have barely scratched the surface, because the bulk of the Halo 4 experience is the multiplayer component. 343 made it their goal to inject more of the Halo universe into the multiplayer options, and that is exactly what they have done. Everything that has to do with multiple players, be it cooperative or competitive play, is now housed within the confines of the UNSC Infinity, home of the Spartan IV program. Basically, multiplayer is presented as if it is a training program for up and coming Spartan soldiers, which makes perfect sense. Everything that Halo fans know and love returns in Halo 4 on the multiplayer level. You have matchmaking, endless customization options, theater and recording options, and a revamped and more accessible Forge mode. On top of these familiar features, there are also a ton of new bells and whistles added to the mix. 343 Industries may be fresh to the series with Halo 4, but this is a studio that clearly worshipped at the altar of Bungie. The feel of the game is virtually identical to past releases in the series. There are improvements to be sure, but it's very surface-level stuff. Things like the in-helmet HUD, which feels more like a head-encasing shell than it ever has before. The graphics in general are the best so far for the series, to the point that it will now become difficult to go back to playing Reach and its predecessors. Lighting and textures see massive improvements over what's come before. This is offset somewhat by the minimal amount of destruction you can cause, but the abundance of eye candy definitely helps to diminish the sensation of running through a series of static environments. Halo 4 may be a tightly presented package with multiple ways to hook into the series' fiction, but its star attraction is never really in doubt. With its revitalized focus on storytelling, characterization, and choice, the campaign manages to completely modernize the franchise - placing the importance of its tale on the same level as the tech and gameplay that make telling that tale possible. Whether it's Spartan Ops' fun-if-somewhat-thin peek into the battle-weary life of newbie Spartans, the satisfying, emotionally charged campaign, or exploring maps and slaughtering friends in all the War Games variants, this Halo's the first outing that's felt like a cohesive, bona fide experience in far too long. Chief's alarmed awakening in the Forward Unto Dawn, a ship misplaced and beset by invaders, is at once a perfect remembrance of Halo: Combat Evolved's opening and an ideal showcase of 343's quickened approach. The game waits for you to advance, as most games do, but the rousing music and implied degradation of the environment makes a leisurely pace seem … wrong. Halo 4 is an expert at making you play along with the unfolding spectacle, and makes sure you're never ensnared by it. There are a few issues to pick out in Halo 4, whether they're to do with the storyline or gameplay. But my experience with Halo 4 was an enjoyable one. The campaign held my interest as I watched Cortana and Master Chief's emotions unfold. Missions were fun. Multiplayer is diverse and just as fast paced and unique a first-person shooter multiplayer experience as I have come to expect from the series. As afraid as you may be of Bungie passing the torch to a new development team to handle a franchise that has the foundation of years of quality behind it, I strongly urge you to keep an open mind for Halo 4, because you just may enjoy it as much as I did.